Your wedding day should be one for the storybooks. You’ll want it to be everything you have dreamed up since you were a little kid, but in the end, the goal is to have you day be different than anyone else’s. From venues, dresses, and color schemes, it’s easy to jazz up your wedding to make it unique. But have you ever thought about switching things up with your flowers? Wedding flowers have the potential to be much, much more than traditional wedding bouquets and aisle markers. Call a wedding florist now, because here are some totally unexpected and unique ways to utilize your flowers for your big day. This works especially well if you are planning a wedding outside. Putting garlands made of ivy or boxwood along the ceiling is a great way to not only cover up exposed support beams but to give your venue a fairy tale theme. You can even hang terrariums or potted plants from the garlands for an even more magical feel. Is there a fountain on the grounds of your venue? Cover it with flowers for a whimsical touch. If you have long garlands of cascading flowers, you will be able to run the fountain without drowning your blooms. Instead of having a flower arch at your ceremony, consider putting in a backdrop. Think of a nine or 10-foot-tall wall of flowers that compliment your colors. You’ll just want to make sure it is wide and long enough for the photographer to capture great shots during the ceremony. Different sizes and colors of pomanders work great for any reception hall to draw the eye upwards. 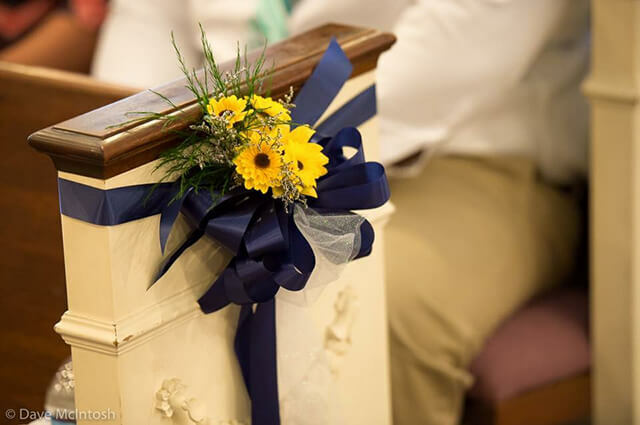 You can have your florist use the same flowers in the pomanders, centerpieces and your bouquets to tie together a theme all throughout the room. These also look great when you to put on trees if you are choosing to do pictures outside in a wooded area. If you are going to have long family style tables, consider using long floral runners in place of huge centerpieces. This will add a unified style throughout the room, and won’t block guests from seeing each other across the table! Are you looking to include some of these ideas into your wedding? You will need a quality florist to do so, and considering there are currently an estimated 36,613 flower businesses located in the United States, you will want one you trust! Contact our floral experts today to get started.